Brighten up your surroundings with your favourite Angry Bird. Each speaker is designed for different devices. The classic Red Bird is compatible with any 3.5mm jack (including music players, phone, and tablet). The Black Bird is designed for the iPod, iPad, and iPhone as well as any music device with a 3.5mm headphone jack. The Helmet Pig is designed for the iPod and iPhone, as well as any music device with a 3.5mm headphone jack. Each Angry Bird Speaker comes packaged in a faux wooden crate. 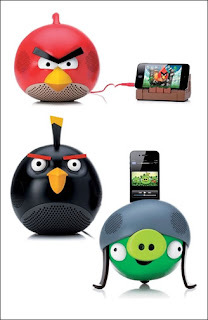 Each Angry Bird Speaker has a powerful 30W Power Output and 2.1 Audio Output (2 speakers and 1 subwoofer). Size H16.5 x W20 x D18.7cm (6½ x 7¾ x 7¼").